Giorgio Morandi is an Italian painter. He was highly inspired by Paul Cezanne’s still life paintings and limited use of colour. Cezanne was Morandi’s Ideal, He based his work on his influence and later went on to become a professor of engraving. Morandi produced a large series of Still life artworks called “Natura Morta”. They convey abstract notions and are composed out of what look like very ordinary things. The pieces are very small-scale and there are lots of space around the objects within the composition, the objects are usually grouped together. The colour in his works is very muted in tone and restrictive. They are passive but not passive and for still life’s they are not always that still. He has created 1350 Natura Mortas and has reused imagery. He uses bottles and boxes that re-occur in a number of his pieces, jostling for space on the canvas. Sometimes little huddles of objects appear to present human relationships because of the way they relate to each other within the composition. Are they a metaphor for Human Relationships? They could be poems in paint or trying to portray distilled quietness. There is an amazing colour range within his works but the colours are very dampened down. 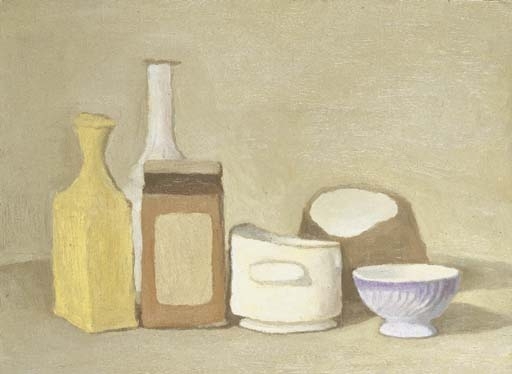 Morandi was also influenced by Ben Nicholson, Wayne Teabold and Paul Coldwell. There is a great amount of compression of space within his still lifes and sometimes it is as if we are at eye level with the objects or on top of the table they are on. Throughout Natura Morta the objects are viewed from different angles. Sometimes the shadows spread across significant areas of the painting and are facing different directions as if there were different sources of light. 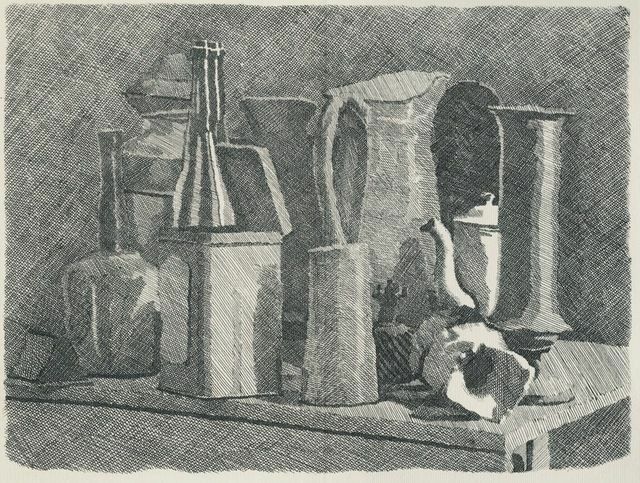 Giorgio Morandi also produced engravings that demonstrated a very fine cross-hatching technique, but retained the same compositional style as the painted Natura Morta where the objects are fighting for space. He created a whole series of paintings where he completely blanks out some of the objects within the works, creating negative space. 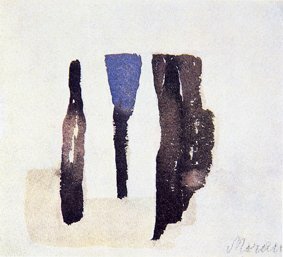 Nearing the end of his life, Morandi produced a series of very economical watercolours which are “barely whispers” of his paintings. Within them there are dense groupings of abstract forms but they are delicate and convey exactly what he sees. 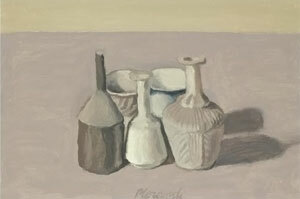 Morandi spent his life drawing and painting what he saw. I have learnt from his work, that going back and drawing what you see can help you to move on and create something interesting. Ideas do not have to be huge, they could just be another way of looking at things. “I don’t know what I’m doing but maybe I could just do that”.